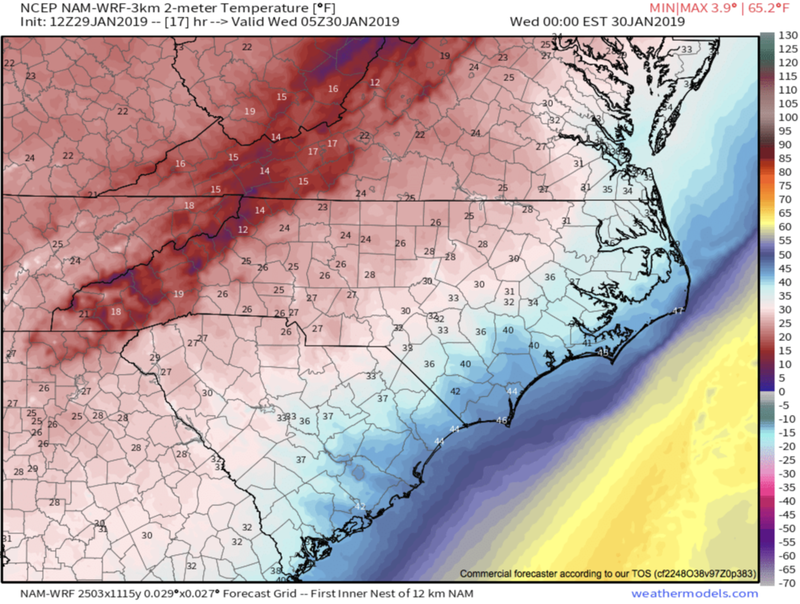 After a brief few hours of precipitation across WNC this afternoon.. temperatures will plummet into the teens and winds will pick up significantly. Wet roadways could turn icy as these temperatures rapidly fall. Please use caution if you are traveling around the area after the sun sets. Temperatures tomorrow will struggle to push above freezing, so limit outdoor exposure if possible! Some snow flurries/showers are likely on the TN/NC border Wednesday morning, and those flurries could even push into Asheville and surrounding areas with winds gusting over 30mph. Join me live tonight at 8pm in the AshevilleWX App where I will detail out my expectations for this backside northwest flow moisture. Below you can see the most recent NAM 3km temperature chart, and it shows temperatures in the upper teens at the Asheville Airport around Midnight. Please bring pets in, and go through the necessary precautions to secure your water sources don’t freeze up. Stay safe, and check back soon for another update!